The departmental UBCcard facilitates food purchases for department meetings and university guests. It functions like a credit card and is used for purchases at Food Services outlets. Purchases made on the departmental UBCcard are GST exempt. Departments can issue multiple cards for different users with one department account, thereby reducing reporting and accounting errors. 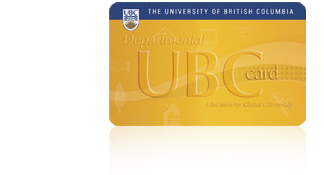 Departmental UBCcards are issued at no cost. Department heads are asked to contact Food Services for more information.